Passwords are not only hard to remember but also hard to manage. Therefore we need the Handy Password tool to protect your passwords which protect your data in turn with perfection. This powerful but easy-to-use password management tool helps you remember your passwords. You can easily login into any web site. All your passwords are stored on your local computer and can be retrieved with the help of a Master password which is the only one you need to remember. Web forms can be automatically filled in, saving you a lot of effort. Passwords are totally encrypted keeping what is confidential impossible to access by unauthorized users. It enables you to save time by using keyboard commands and folder search options. It is available free of charge and is extremely easy to install and use, given the clarity of its interface and commands. Keep your passwords handy with the Handy Password tool. 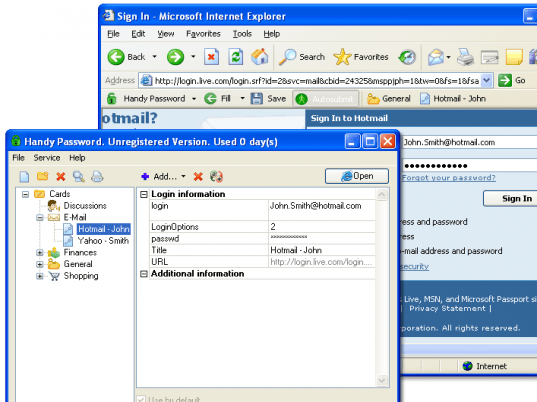 Installing a password manager can be installed on your pc or usb flash drive. And it’s a perfect decision if you’re afraid of having forgotten your passwords or access codes. Most password managers attach themselves to web browsers and, once configured, automatically enter your usernames and passwords as you surf the Internet. They have different realizations and may vary in interfaces, but most of them are quite reliable and easy to use. There was only one common disadvantage: they become useless if you are on of those people who prefer to have all their sensitive information with them wherever they go. You can’t always carry a CD with a configured password manager with you, and even if you can, you’re not certain to be able to install it on every computer you use. cool program! now i dont need to remember passwords!